Item Type: Sealing Wax Spoon. 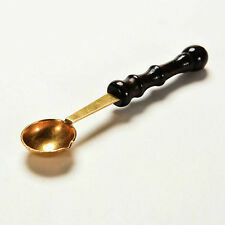 1PCS Sealing Wax Spoon. Specially designed for wax seals, wooden handle can prevent being scald. Pointed mouth design convenient for wax seals production. Application: Wax Seals. Handle Material: Rosewood. Wax Stick Length: 9cm/3.5". - 1 Letter A Badge wax seal. - 3 Different colors wax sticks. Seal Head Material: Copper. Seal Total Length: 9.0 cm / 3.5". Handle Material: Rosewood. - 1 Letter A Badge wax seal. Wax Stick Length: 9cm/3.5". - 3 Different colors wax sticks. Seal Head Material: Copper. Seal Total Length: 9.0 cm / 3.5". Handle Length: 7.0 cm / 2.8". Tonic mini blending bristle brushes feature a compact, easy-to-grip, turned wood handle and are excellent for stippling inks, paints and powders onto your projects. This package contains three 65mm x 25mm x 25mm brushes. Handle Material: Rosewood. Wax Stick Length: 9cm/3.5". - 1 Letter A Badge wax seal. - 3 Different colors wax sticks. Seal Head Material: Copper. Seal Total Length: 9.0 cm / 3.5". Handle Length: 7.0 cm / 2.8". 1 Stamp Kit. Material: Rubber. Color: As Picture Show. Carve your own unique stamps out of styrofoam, erasers, potatoes, craft foam and more with the Knorr Prandell linoleum cutting set. Knorr Prandell lino printing box set containing five precision cutters in styles 1 to 5 and a sturdy lino cutter handle with expandable collar for easy blade fitting and tightening. Protect your worksurfaces with a non-stick craft sheet by HardiCraft. - Heat resistant up to at least 260 degrees Celsius - Water repellent - Non-stick - Suitable for use with paint, ink, adhesives, candle wax, soap, clay and more - Re-usable - Easy clean. Your chosen stamp will stick to this block, so you can position and reposition them on the block before inking and stamping onto your paper or card. Allows you to see exactly where you are stamping exactly. 3 Piece Sponge Dauber Set. Crafts Too. Spectrum Noir Ink Pad Storage Trays 6PC. This Spectrum Noir Ink Pad Storage is perfect to keep your craft area neat and tidy. We will always dispatch our most up to date product to you. We are happy to help! ACRYLIC STAMPING BLOCKS. YOU WILL RECEIVE 6 BLOCKS. MADE FROM 5 mm ACRYLIC. SIZE 4.5cm x 5.5cm 5mm thick. LAZER CUT FOR SMOOTH EDGED FINISH . These are the sizes we have been asked for the most. THESE ARE FANTASTIC QUALITY . Peel off stamp and stick onto an acrylic block. Ink and press to transfer image onto project. Personalised DIY Self Inking Rubber Stamp Kits Customised Business Name Address! 1 Stamp Kit. Material: Rubber. Cut the foam to slightly larger than your stamp. Peel off the white backing sheet to expose the adhesive side and attach the stamp. Now trim off the excess sheet so just your desired stamp is exposed. Ranger Letter It Background Stencil 4¾"x6"
Can be used to make personal stamp easily. Anyway we will try our best to avoid this kind of thing. Material: resin. Due to the light and screen difference, the item's color may be slightly different from the pictures. 1pc wax seal stamp Only, wax not included. 1 x Wax Seal. Wind Up Toys. Preschool Toys & Pretend Play. Total length: Approx. Train Model Series. Size Chart People always bought together with. The daubers are ideal for applying ink, chalk, paint and more to your paper projects. (Ink and other accessories are NOT included). 1 x Sponge Daubers. Great for applying ink; chalk; paint and more to your paper projects. Ranger Cut-n-Dry Stamp Pad Felt. 8" x 10" stamp pad felt for use with dye-based inks. Great for use with Ranger's Adirondack, Distress, Stamp it, and Archival inks. Create rainbow combinations and patterns you've always dreamed of! Fine cloth top with non skid backing.